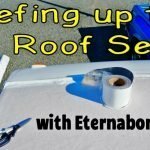 Resealing My RV Roof With Eternabond Tape - Love Your RV! 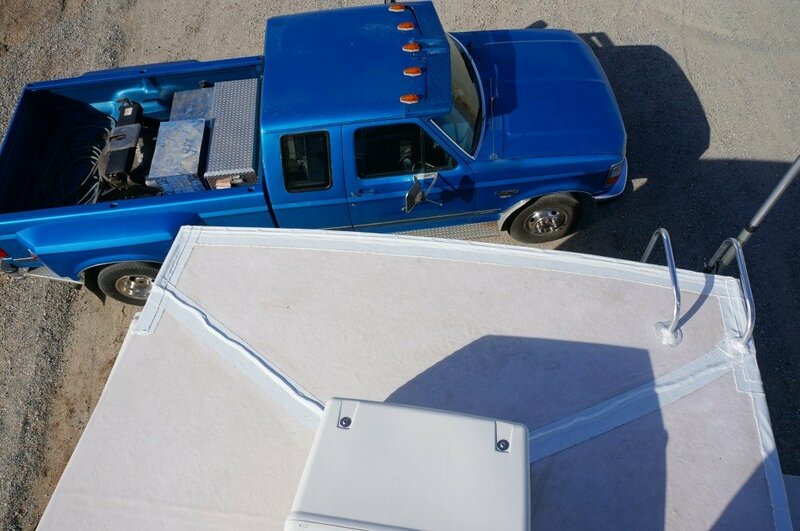 Our Keystone Cougar fifth wheel trailer is now nearly 4 years old and starting to show signs of age on the roof seals. 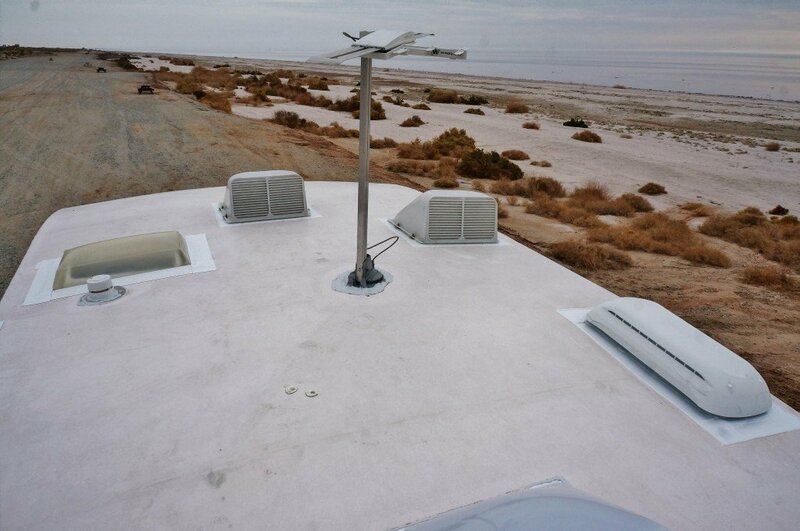 It is a rubber type roof using a material called EPDM (ethylene propylene diene terpolymer) and sealed for the most part with Dicor Lap sealant. Every few months I check over all the seals and look for any cracks or holes in the lap sealant and patch it as needed. 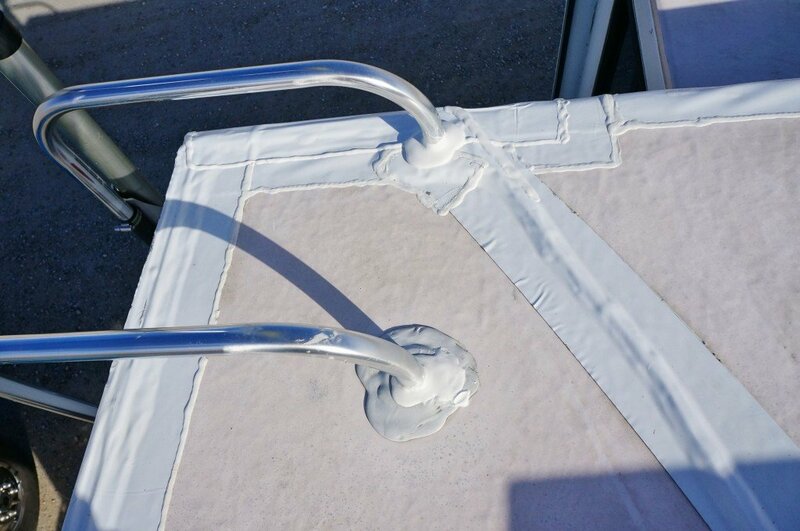 This summer I noticed a spot along the driver side gutter where the sealant was pulling away from the rubber roof material and causing a small leak to develop. 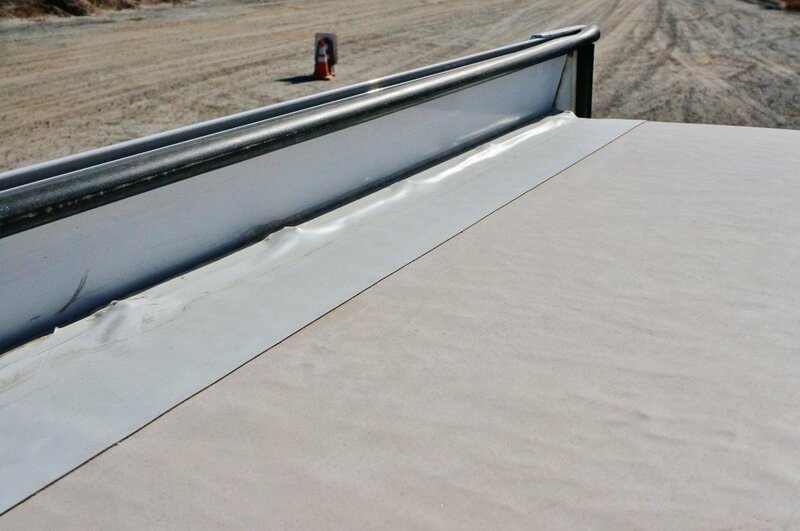 Water would bypass the gutter strip and dribble down the trailer sidewall. 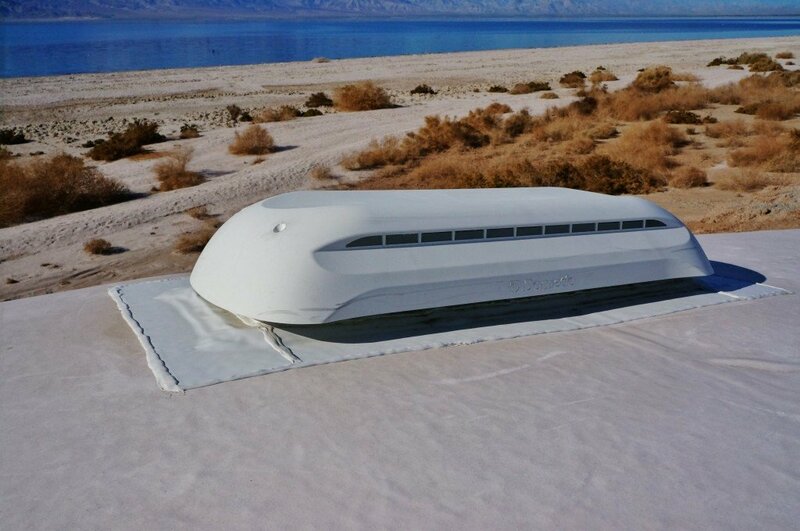 I knew this had to be dealt with before the water might get behind the sidewalls Filon coating and delamination occur. Unfortunately Keystone had used silicone to seal the gutter strip and as is pretty well known silicone doesn’t adhere well to rubber roof materials. I really didn’t want to be having to remove the gutter strip, clean off all the old silicone and reseal it again. I asked the Keystone dealer where I bought the trailer and they recommended a marine grade silicone sealant. They advised to carefully dig out the old silicone and seal over. I didn’t feel this was a great idea so I’ve decide to try Eternabond tape right over the whole corner of the roof edge. I have just finished installing a Fantastic Vent fan and used the Eternabond tape as a seal and absolutely loved it. In fact I decided to redo all the roof seams and seals with the tape in hopes of preventing any costly leaks in the future. Prepping the surface before laying down the tape is the most important step. You want to get the surface as clean as possible. The nice thing about Eternabond is it will stick to the Dicor lap sealant so you can cover right over the old stuff. You just have to make sure it is clean. 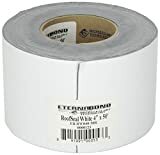 There are commercial products to do the job including one from Eternabond. My sealant was pretty grimy so first thing I did was clean it up with mineral spirits, available at any hardware store. 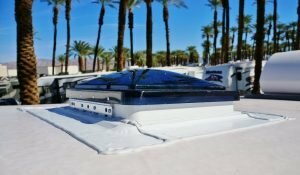 Now, there is a big caution when using mineral spirits on a rubber roof. 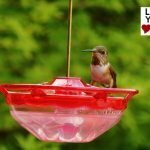 Use as little as possible, soak it on a rag, scrub off the dirt, then wipe off the residue with a clean rag. 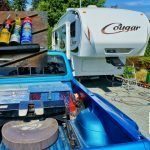 Mineral spirits is petroleum based and can damage a rubber roof, but man does it ever clean up the dirty lap sealant super well with hardly any effort. I’ve also heard the acetone or isopropyl alcohol works pretty good too. Go with whatever you feel is best. If you have stains that are still difficult to remove, like tree sap, try mineral spirits, but with a BIG CAUTION: Do NOT use mineral spirits unless you carefully follow these directions. Mineral spirits is a petroleum distillate, and a rubber roof can react with swelling, deterioration and discoloring. Next I gave the surface a clean with Windex hoping it would remove any leftover mineral spirits. Then I used the EternaClean spray cleaner followed by the EternaPrime primer spray which makes the surface tacky and helps the tape stick better. Finally my surface was prepped and ready for the tape. This is by far the tricky part. THIS STUFF IS STICKY! It comes with a clear plastic backing which you peel off to expose the sticky back side of the tape. You really only have one shot to lay the tape down it sticks so well, almost like warm gum on pavement. Once down it’s almost impossible to get it back up to try a second time. You also have to watch that it doesn’t roll back on itself and stick together. I found by taking my time and peeling a little off at a time it wasn’t too hard, just have to be super patient and concentrate. I started with the vents first as they were just 4 straight pieces to make a square so gave me some experience before I tackled the more irregular angles of the rigs roof. 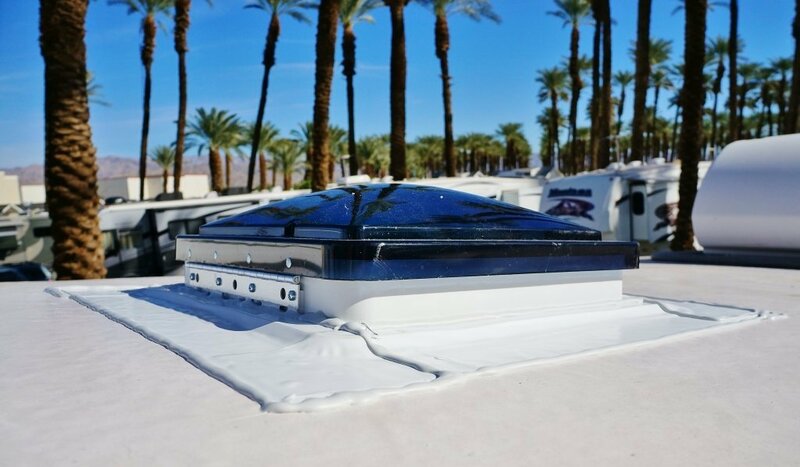 Once the tape is in place and stuck to the roof the instructions call for pressure to be applied to all areas of the Eternabond tape to activate the bonding process. I used my hand and fingers to do this and pushed/rubbed down really hard along the tape making sure the tape was molded right over things, like the old lap sealant underneath and roof corner molding. 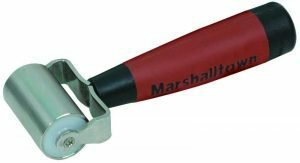 A steel roller called a seam roller is a recommended tool for this job as well. I purchased a couple 50 foot by 4 inch rolls to start. 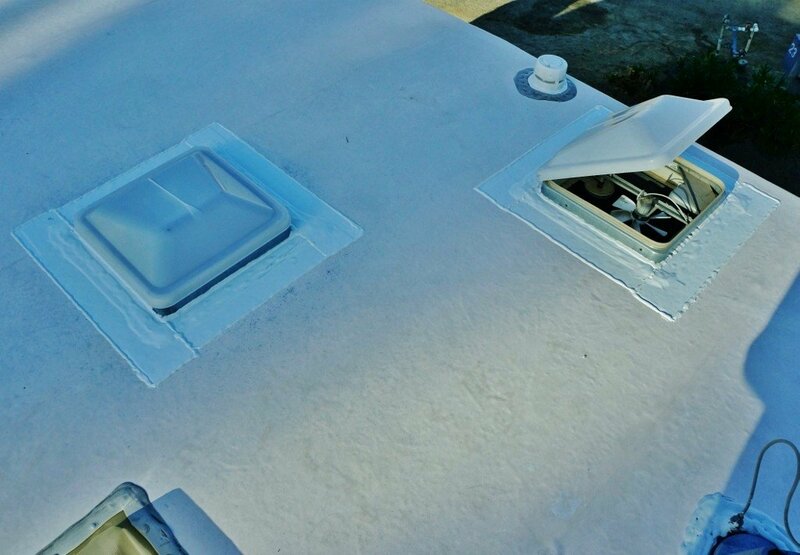 I knew it was plenty to do all the vents, back end, slide-out roof and along the side where the sealant was failing. These are basically the areas of most concern. I decide on 4 inch wide rolls to give me plenty of coverage. No one but me sees the trailers roof so looks is not important, it’s all about getting a good seal. After the tape is all in pace you may find a few bubbles where air is trapped underneath. The instructions say use a pin to make a hole and expel the air then push the tape down to seal the hole. If it is a large crease, the tape can be cut and re-laid in place and then covered by a new piece of tape. I decided to also run a bead of lap sealant all along the tape edges to prevent them from peeling up over time. I feel much more confident that the roof will remain leak free now and will be soon picking up another 50 foot roll to finish it off. 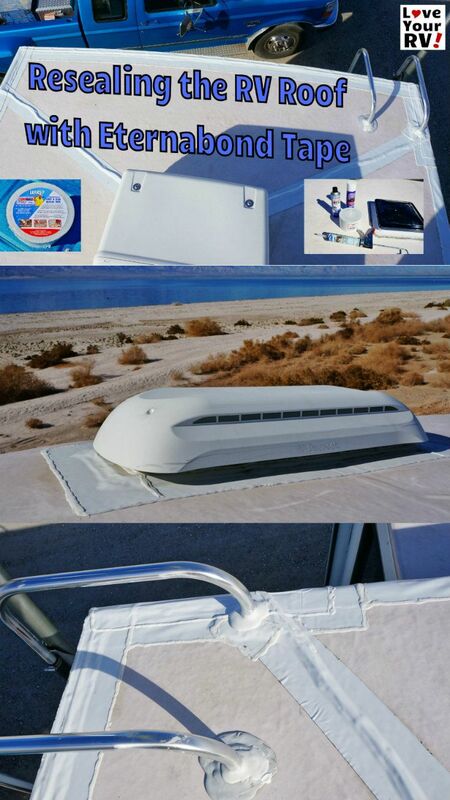 Total investment at that point will be around $200 dollars but if it prevents a leak that’s not too much to spend. 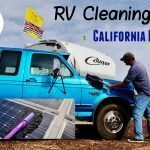 I’ve seen the damage a leak can do in an RV and it gets very costly, very quickly. 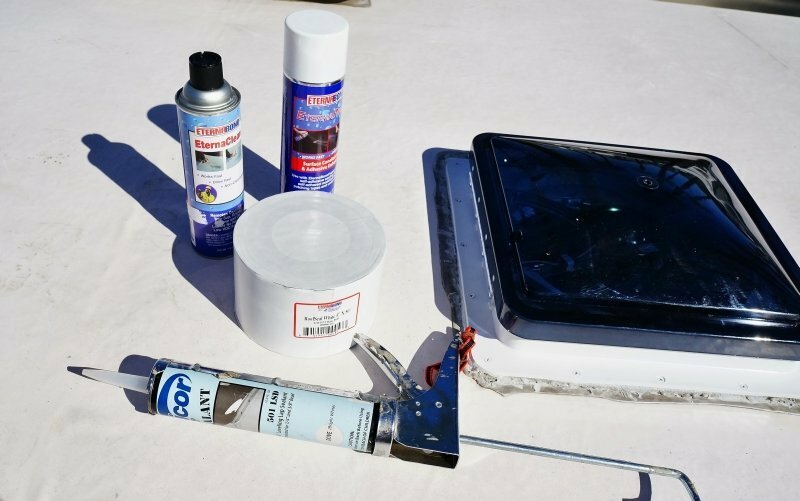 The tape has a long estimated life span of 18-35 years so it will also eliminate the ongoing maintenance of the regular roof sealants I was doing, saving me time and money down the road.